"The real objective of Socialism is human brotherhood"
The above quotation from George Orwell is a fairly classic Leftist comment. "All men are brothers" is a cry from Leftists that goes back at least to the 19th century. I document an 1894 example of it here (just before the half-way mark in the article). And we must not forget that "fraternite" was one of the 3 aims of the French revolution. And it all fits in very well with some remarks I made recently about the emotional importance of "connectedness" in human beings. Because of their disgruntlement with the world about them, Leftists tend to feel disconnected from their own society but do nonetheless miss that sense of connectedness badly. So they make up a fantasy (and impossible) world in which they have a superabundant amount of connectedness: A world in which all men are brothers. Is the gingerbread man nuts? "You can't catch me, I'm the Gingerbread Man"
I read your column with particular interest this morning because it echoed a conversation I had with a friend last night. My reaction then, as to your column, is that Blago is a classic personality disorder--Axis II in the DSM, which, technically, is different from psychosis, although part of an Axis II diagnosis is a vulnerability to psychotic episodes. The question here is reality testing and the quality and the extent of loss of reality testing. Psychotics' loss of reality testing tends to have a bizarre flavor--Martians planting radios in the brain, the next door neighbor spying on them, etc. Personality disorders' reality testing deficits tend to be more in the line of "I wish it, therefore it is, or I don't wish it, therefore it isn't." There were times during the Clinton administration when, imo, both Bill and Hill seemed to wander pretty far into that territory. My guess is that we will see some of the same when pressures get to O. If I were Blago's attorney and wanted to use an insanity plea, I would go for the episodic psychosis, but if I were a juror, I wouldn't buy it. His behavior is, to me, just garden variety sociopathic personality disorder behavior. And in the context of the Illinois Combine, there were simply insufficient contextual signals to make him moderate it. No, he's not nuts. Having been an AUSA for a long time, one thing I noticed is that normal, honest people have difficulty understanding how criminals think. (This shows up, for example, in the death penalty debates I do, where abolitionists simply don't grasp the heartlessness and cruelty that some killers display. It's simply beyond their experience). Blago's world is merely corrupt; it's not insane. To him, a Senate seat is not a public trust, it's a commodity. It has a price, and the most efficient mechanism for determining that price is to put it on auction, which is what he did. Far from being insane, it's perfectly clear-headed -- just venal. Mortgage markets should operate as well. There are two other factors tending to argue that Blago was thinking clearly. First, the quality of one's thinking must be measured in the environment in which it occurs. Blogo was a powerful man. His prior years of greed had gone, not merely unpunished, but rewarded, ultimately with the Governor's Mansion. It might well be mistaken, but it is hardly insane, to believe that the behaviors that got you so much for so long will continue to work. In this respect, Blago is more than a little reminiscent of both Elilot Spitzer and John Edwards, who, although high-profile and ambitious public figures under considerable real (and even more potential) press scrutiny, nonetheless thought they could continue to chase skirts with the joyfulness (and abandon) of an anonymous Wal-Mart worker in his twenties. The cocoon of arrogance and the feel of invulnerability that comes with getting away with this stuff for years -- as Blogo, Spitzer and Edwards all did -- comes to be their environment. A person is not crazy for living in his environment and adapting his behavior to it; indeed he'd be crazy to do otherwise. Second, the absence of insanity is strongly suggested by the large number of candidates who joined the auction and put in their bids (or at least explored what the bidding might look like). We don't know yet who all these people were, but it's a safe guess they were some powerful and prominent citizens. Are they all crazy? No. They were, like Blago, acting rationally in the environment at hand (which they did much to create, but that's another story). Of course, sometimes rational but corrupt people get caught, and this appears to be one of them. If they were always caught, or always (or close to always) made to pay a significant price for their misdeeds, then there would be a better case for thinking them to be insane. But that's not remotely how it works -- and they know that. It's not so much that Spitzer and Edwards will walk away from their respective scandals the multi-millionaire celebrities they were when they walked in, with a fawning (for liberals) press telling us that (a) everybody does it, or (b) to err is human, or (c) we can't be so judgmental, or (d) [fill in the blank]. It's that we (or at least they) learned from The Big One ten years ago. Bill Clinton disgraced his office, lied, and encouraged or (possibly) arranged for others to lie. He also granted at least one pardon after the pardonee's former (but still friendly) wife forked over a few hundred thousand in "contributions." And what happened? Clinton's popularity went up, his spouse became a serious candidate for President, he's touted by the press as an elder statesman, his guy at DoJ who checked off on the pardon is about to become Attorney General, and of course Clinton himself lives a life of luxury and adulation. The world of perverse incentives that the Left labored so long to create has arrived. Is Blago nuts? Not hardly. Bailout: The New American Business Model: When the government steps in to own banks, automakers, and more, then we lose our freedom. We must stand united and demand a conservative approach from our elected leaders. No more bailouts. No more big government. No more socialism. This is still America, isn't it? Would you buy a car from Congress? Leave it to Bob Lutz, GM's voluble vice chairman, to puncture the unreality of the auto bailout he himself has been championing. In an email to Ward's Auto World, he notes an obvious flaw in Congress's rescue plan now taking shape: The fuel-efficient "green" cars GM, Ford and Chrysler profess to be thrilled to be developing at Congress's behest will be unsellable unless gas prices are much higher than today's. Very few people will want to change what has been their 'nationality-given' right to drive big and bigger if the price of gas is $1.50 or $2.00 or even $2.50," Mr. Lutz explained. "Those prices will put the CAFE-mandated manufacturers at war with their customers -- and no one will win in that battle." Translation: To become "viable," as Congress chooses crazily to understand the term, the Big Three are setting out to squander billions on products that will have to be dumped on consumers at a loss. None of this was mentioned at four days of congressional bailout hearings, because Detroit knows better than to suggest Congress has a role in the industry's problem. Yet its own recently updated Corporate Average Fuel Economy regime, or CAFE, makes a mockery of the idea that government money will render the companies profitable, even as the same bailout bill demands that the Big Three drop their legal challenge to a California mileage mandate even more unsustainable than the federal government's. Forget Chrysler, which has needed a bailout from Washington or Stuttgart in three of the last four recessions. The tragedy of GM and Ford is that, inside each, are perfectly viable businesses, albeit that have been slowly murdered over 30 years by CAFE. Both have decent global operations. At home, both have successful, profitable businesses selling pickups, SUVs and other larger vehicles to willing consumers, despite having to pay high UAW wages. All this is dragged down by federal fuel-economy mandates that require them to lose tens of billions making small cars Americans don't want in high-cost UAW factories. Understand something: Ford and GM in Europe successfully sell cars that are small but not cheap. Europeans are willing to pay top dollar for a refined small car that gets excellent mileage, because they face gasoline prices as high as $9. Americans are not Europeans. In the U.S., except during bouts of high gas prices or in the grip of a Prius fad, the small cars that American consumers buy aren't bought for high mileage, but for low sticker prices. And the Big Three, with their high labor costs, cannot deliver as much value in a cheap car as the transplants can. Under a law of politics, such truths were unmentionable in last week's televised circus because legislators are unwilling to do anything about them. They won't repeal CAFE because they fear the greens. They won't repeal CAFE's "two fleets" rule (which effectively requires the Big Three to make small cars in domestic factories) because they fear the UAW. They won't hike gas prices because they fear voters. And make no mistake: An even more massive auto wreck lies ahead when a soon-to-be taxpayer-financed and taxpayer-owned auto industry confronts a California rulemaking that, in a silly gesture against global warming, would render most of its auto designs, profit centers and tooling unsalvageable. We hate to admit it, but the only good idea from the bailout debate is the proposal for a new "auto czar." Along with disposing of Chrysler and downsizing Ford and GM, his job should be to confront Congress with its own policy cowardice and failure. If saving gasoline and Detroit are both worthy goals, let's ditch CAFE and institute a gasoline tax to make consumers value the cars government is forcing auto makers to build. If Congress doesn't have the tummy for that, at least ditch the "two fleets" rule so Detroit can import small cars to meet the mandate. Alas, Barack Obama's vaunted "change" apparently doesn't include spending the political capital to make Congress acknowledge the failure of CAFE. If he can't do better than throw taxpayer money at a dismal policy disaster like our fuel-economy regulations (and so far he seems to be joining Congress in pretending it's all Detroit's fault), we might as well give up on his presidency along with any hope of progress on the nation's other unresolved dilemmas. His campaign never really answered the question of whether he was Chance the Gardener or Abraham Lincoln. We might as well find out now. Politics posing as financial analysis: "Why the rally? It isn't really about the actual stocks, says CNBC stock guru Jim Cramer. It's about the end of the Bush administration. "The whole source of this rally is President Bush, meaning that each day we come closer to getting rid of him is a day where the market is better," Cramer writes on BloggingStocks." Fighting Racism, U.N.-Style: "One of Colin Powell's best moves as Secretary of State was to pull out of the United Nations' 2001 conference in Durban against racism once it became an anti-Semitic rant. One of the best moves the new U.S. Administration and Europe could make is to stay away from the follow-up meeting altogether. "Durban II," planned for April in Geneva, promises to be an encore of the same old Israel-bashing. The draft declaration says Israel's policy toward the Palestinians amounts to no less than "a new kind of apartheid, a crime against humanity, a form of genocide and a serious threat to international peace and security." We'll spare you the rest. Israel will be the main obsession, but it's not the only target. The draft declaration also goes after the West's freedom of speech and antiterror laws"
Will Volvo ever be the same again? "Volvo, the quintessentially middle-class Swedish marque, could soon be in Chinese hands after it emerged that Ford, its owner, is in talks with one of China's biggest carmakers. Last week Ford said that it was considering all options for Volvo, its last European brand. The American group has been selling businesses over the past two years as it struggles to bolster its balance sheet. Now it is under even more pressure as, like the rest of the car industry, it faces one of the most depressed markets for decades. Ford is in talks with Changan, one of the six biggest Chinese manufacturers with a history stretching back to 1862, about selling Volvo, which it has owned since 1999. Changan is a joint venture partner of Ford in China and has worked with the American carmaker for seven years. It is believed that early negotiations took place last month between Xu Liuping, Changan's president, and Ford and Volvo executives at a motor show in Guangzhou". They can't catch me. I'm the gingerbread man: "The list of crooked politicians is long, and the list of stupid politicians even longer. But if the criminal allegations made yesterday against Illinois Governor Rod Blagojevich are proven in court, rarely will a politician have combined the two qualities with such efflorescence. The second-term Democrat knew that a grand jury probe was under way into corruption in Illinois politics, and that one of his fund raisers, Tony Rezko, had been convicted and is cooperating with prosecutors. Yet according to those prosecutors, Mr. Blagojevich talked openly in recent weeks about selling a U.S. Senate seat, trading government favors for campaign cash, and punishing the owner of the Chicago Tribune if it didn't fire members of the newspaper's editorial board. The Governor's comments were taped in court-approved wiretaps and include such self-incriminating classics as: 'I've got this thing [the power to appoint Barack Obama's Senate replacement] and it's [expletive] golden, and, uh, uh, I'm just not giving it up for [expletive] nothing. I'm not gonna do it. And, and I can always use it. I can parachute me there.' We recommend the entire 76-page FBI affidavit for every high school civics course as proof of the need for political checks and balances. If convicted, Mr. Blagojevich would be the second consecutive Illinois Governor to be found guilty of a felony, and the fourth in 35 years." Questions about the Obama/Blagojevich relationship: "Asked what contact he'd had with the governor's office about his replacement in the Senate, President-elect Obama today said "I had no contact with the governor or his office and so we were not, I was not aware of what was happening." But on November 23, 2008, his senior adviser David Axelrod appeared on Fox News Chicago and said something quite different. While insisting that the President-elect had not expressed a favorite to replace him, and his inclination was to avoid being a "kingmaker," Axelrod said, "I know he's talked to the governor and there are a whole range of names many of which have surfaced, and I think he has a fondness for a lot of them." ... But there remain questions about how Blagojevich knew that Mr. Obama was not willing to give him anything in exchange for the Senate seat -- with whom was Blagojevich speaking? Did that person report the governor to the authorities? And, it should be pointed out, Mr. Obama has a relationship with Mr. Blagojevich, having not only endorsed Blagojevich in 2002 and 2006, but having served as a top adviser to the Illinois governor in his first 2002 run for the state house." I have been writing -- sporadically -- on topics in moral philosophy for many years now (See here) so I think it is time for me to ask if I have learnt anything over the years. I think I have. In particular, I think I have now arrived at a complete answer to what Leftists say about the matter. "Complete answer" is a very bold expression for a philosopher to use but readers will be the ultimate judge of whether I have achieved that, of course. The nub of the Leftist argument is that "right" and "wrong" language is incoherent. Saying "X is pink" and "X is right" seem on the surface to be the same sort of statement but we can immediately see that they are not. Pinkness is an objective property that we can point to whereas rightness exists only in the mind of the speaker. "Who says?" is a complete refutation of any claim that something is right. Religious people can say that "God says" but since religious people do differ considerably on moral questions (e.g. abortion) it is immediately obvious that it is only an opinion about what God says that we are dealing with. And how can an opinion have any objective reality? So the Leftist concludes that there is no such thing as right and wrong, just different opinions and value judgements. You cannot find rightness under a rock and you cannot find it anywhere so it does not exist as such. I did three courses in philosophy in my years as a university student and was always exposed to the above analysis. And up until fairly recently I accepted it as describing at least one sort of moral statement. I was always aware, of course, that nobody ever talks as if they believed it. Leftists are in fact very quick on the draw with moral language. They can say that there is no such thing as right and wrong and then immediately and with a straight face go on to say that "racism" or "intolerance' is wrong. And George Bush is of course EVIL! "What is it to commend something? Although Hare doesn't say very much about this, he does say that "when we commend or condemn anything it is always in order, at least indirectly, to guide choices, our own or other people's, now or in the future."' So if to call something good is always to commend it, to do so must always be to guide choices in some way. This emphasis on guiding choices fits many cases quite well. If we are trying to decide what movie to go to and someone tells us that Ed Norton's new film is a good movie, then it would be natural to take that remark to be an attempt to guide our choice. However, not all cases are this direct. We often say that certain things are, or were, good so and so' s even though we don't envision ourselves or others having the opportunity to make choices on the basis of that information. Personally, I would say that Ronald Reagan was a good president of the United States, even though I don't expect anyone to have the opportunity to vote for him again-- or even for anyone very much like him. Or, to use a nice example due to my former student Rebecca Entwistle, I would say that when the College of Cardinals selected Pope John Paul II, they chose a good pope. I am willing to say this to people despite the fact that I know that none of them is in the College of Cardinals, and they will never have any occasion to choose a pope, or even to influence such a choice. How does this square with Hare's idea that to call something good is always to commend it, where to commend it is always to guide choices, directly or indirectly?" 4. X has an inescapable, universal "moral" quality. 5. X is the prevailing rule around here (though if the person was asked why that rule exists he would almost certainly reply by referring to some version of one of the preceding three statements). I think most people would agree that "You ought" or "is right" statements can mean 1, 2, 3 or 5 above. I do. You might dispute the truth of any of them but you would understand what is being said and understand that it is a factual claim. I would for instance dispute an "ought" statement that is unpacked as 3 above because I am an atheist but I accept that the person making the claim is trying to make a statement of fact that can be proved or disproved in some way. So. at least in the senses 1, 2, 3 or 5 above, there clearly IS such a thing as right and wrong. Interpretation 4 above however is the difficulty because it is apparently untestable and undemonstrable -- and is hence the one that Leftists focus on. They claim it is gibberish even though the usage does seem to be widespread. And I think that the widespread nature of such statements is the key to understanding them. I think that such statements arise because human beings do have inborn, hardwired moral instincts. So a person who uses "is wrong" statements of that ilk is expressing an important instinct. He is in fact referring to something quite objective: Normal human feelings and instincts. He is saying: "That goes against normal human feelings and I know it does because it goes against feelings deep in me". He could of course be wrong. His own feelings might not be a reliable guide to what is general -- but it is nonetheless a factual claim that can be disputed. Such a person might, for instance, say "murdering babies is wrong" and mean that as a universal and unquestionable claim about how normal people respond to the idea of murdering babies. But we can argue with him about the matter by pointing out that the undoubtedly brilliant civilization of ancient Greece routinely allowed the killing of babies in some circumstances. So the argument is an empirical one, not an unfalsifiable claim. And that is what I have only recently come to see. I am not of course saying that the unpacking I have offered above is always high in the consciousness of the person making such statements. Most people use the word "dog" with great confidence but would be rather hard put to define a dog when you remark that dogs can be of many shapes, sizes and colours. So what defines a dog? When pressed the person might say a dog is "tailwagger" -- but is a boxer dog with an amputated tail not a dog? And so it goes on. Similarly, "is right" statements can be used with considerable accuracy and meaningfulness even though the person using such statements might not be able to unpack them readily or at all. Because the standard psychological measures of moral attitudes (e.g. Kohlberg's) are profoundly contaminated by the Leftist assumptions of their authors, I have not even tried to look up inheritance data about morality in the behaviour genetics literature -- though there is some supportive evidence mentioned here and here (referring to the work of Hauser and Haidt respectively) and the idea is to be found in the work of various well-known writers -- e.g. Steven Pinker and James Q. Wilson. So suffice it to say that most important human characteristics seem to show very substantial genetic inheritance (See e.g. here and here and here, and some work on a genetically-coded social abnormality reported here, here and here). If morality were an exception that would be most surprising. And from the viewpoint of evolutionary biology, it would be even more surprising. Man is both a social animal and an animal that falls very readily into conflict with his fellow humans. So ways of regulating behaviour to enable co-operation and forestall conflict must necessarily be of foremost importance. And that is largely what moral and ethical rules are all about. To forestall conflict there HAVE to be rules against murder, stealing, coveting your neighbour's wife etc. And that is why there are considerable similarities between the laws of Moses (ten commandments etc) and the much earlier Babylonian code of Hammurabi. The details of moral and legal rules are of course responsive to time, place and circumstances, but there are some basics that will almost always be there. And given the importance of those basic rules for social co-operation, it should be no surprise that such rules became internalized (instinctive) very early on in human evolution. So many if not most of our social instincts are in fact moral or ethical instincts. Ethics are the rules we need for co-operative existence. Additionally, we are the animal that relies least on instinct. So all our instincts can be both modified and defended by our reasoning processes. Just because a thing is instinctive to us it does not mean that the behaviour concerned is emitted in any automatic way. We think about why we do what our instincts tell us and generally conclude that our instincts are thoroughly wise! And we do generally explain our rules of behaviour in a thoroughly empirical and functional way -- generally starting with: "If everyone did that .... ". And moral philosophers are of course people who specialize in such talk. But, as Wittgenstein often pointed out, all such talk is largely epiphenomenal (an afterthought). It is predominantly their set of inherited dispositions that make people behave ethically, not any abstract rationalizations. And that realization does explain why philosophers so often back themselves into absurd corners. You might guess what is coming next at that point: Peter Singer. Peter Singer (a former student of R.M. Hare) is undoubtedly a very able and influential philosopher and in good philosophical style he starts out with a few simple and hard-to-dispute general rules from which he logically deduces all sorts of conclusions that are greeted with horror by normal people -- his view that babies and young children may be killed more or less at will, for example. As a theoretical deduction, his views are defensible but seen in the light of the biological basis of morality, they are counterproductive. A society that killed off its young more or less at will would not last long. A famous objection to any claim that moral statements are at base empirical and hence rationally arguable is the objection by David Hume. David Hume contends that there is an unbridgeable gap between "is" and "ought" statements -- so that you cannot justify "ought" statements by "is" statements. Yet that is precisely what people normally do. An "ought" statement always commends some course of action and when people ask WHY that course of action is commended the reply is often in terms of "is" (empirical) statements (e.g. the commendation of X can be explained as: "X leads to generally desired consequences" or "X leads to consequences that you would like" or "I like X" or "X is the prevailing rule in this culture"). So in my view the fact that an "ought" statement can be explained in that way shows that it is an empirical statement to begin with. Statements in general have all sorts of influences on people (for example, if someone said to me: "Your son has just died", it is clearly an empirical statement but it would also have an enormous influence on me if true. It would cause me to take many actions that I would not otherwise take) and an "ought" statement is an empirical statement with what is expected to be one particular sort of influence -- it is meant to cause you to behave in the way described (Something that R.M. Hare also saw). So an "ought" or "is right" statement is simply a shorthand (compressed) "is" statement that can be expanded in some way if desired. It might be noted however that there seems to be a gradient in "good", "right" and "ought" statements, with "ought" statements being most intended to incite action and "good" statements least so. Corrupt Obama pal finally caught: "The governor of Illinois has been arrested for conspiring to sell an appointment to US President-Elect Barack Obama's recently vacated Senate seat in what prosecutors called "a political corruption crime spree". Governor Rod Blagojevich and his chief of staff, John Harris, were also accused of demanding kickbacks for government contracts, jobs and appointments and trying to get certain editors fired from the Chicago Tribune newspaper because of their critical coverage of his administration. "The breadth of corruption laid out in these charges is staggering," US attorney Patrick Fitzgerald said." More Chicago crookedness close to Obama: "A former Illinois bank official, now claiming whistleblower status, says bank officials replaced a loan reappraisal that he prepared for a Chicago property that was purchased by the wife of now-convicted felon Tony Rezko, part of which was later sold to next-door neighbor Barack Obama. In a complaint filed Thursday in the Circuit Court of Cook County, Kenneth J. Connor said that his reappraisal of Rita Rezko's property was replaced with a higher one and that he was fired when he questioned the document. Mr. Connor, a real estate and commercial credit analyst at the Mutual Bank Corp. in Chicago, also noted in the complaint that the bank received a grand jury subpoena in October 2006 requiring it to produce information concerning Mrs. Rezko's purchase, including the bank's files on the property. Obama stays silent over Robert Mugabe's rule in Zimbabwe: "More than five months have passed since Barack Obama last commented about the humanitarian disaster in Zimbabwe, a period that has seen it lurch from political and economic crisis into a cholera epidemic. A spokeswoman for the President-elect's transition team indicated yesterday that she would be willing to issue a statement on his behalf. In contrast, President Bush repeated British-led calls for an end to Robert Mugabe's tyrannical rule that have found an echo across Europe and parts of Africa in recent days. Although Mr Obama has been keen to avoid second-guessing the White House on foreign policy issues and emphasised that there can only be "one president at a time", this does not explain a prolonged period of silence that now stretches back to June 24." "I want you to listen to me. I'm going to say this again: I did not have any relations with that man, Mr. Blagojevich. I never told anybody to buy my Senate seat, not a single time; never. These allegations are false. And I need to go back to work for the hope of the change." A group of researchers (all women, as it happened) looked at annual math assessments required by the No Child Left Behind law from 10 representative states that supplied details about gender and ethnicity, a total of 7 million students. Their study, published in the July 25 issue of Science, found no differences between girls and boys in average performance -- not even, as earlier studies had found, once they entered high school. The gap between girls and boys on math SATs, they said, could be explained by the fact that more girls than boys go to college and therefore take these tests. But, echoing Summers's point, there was small yet significant variance between the genders -- the degree to which the scores of girls or boys differed from the average. At the very highest level, the 99.9th percentile, the difference meant 2.15 males for every female. This difference was large enough that, in an occupation requiring math skills at that level, the job ranks could be expected to be filled 68 percent by men, 32 percent by women -- enough to explain, as Summers suggested, part of the gender gap. Studies comparing girls and boys in different countries add to the puzzle, both underscoring gender differences and suggesting that the influence of cultural factors may be greater than Summers thought. In performance on a standardized math, science and reading test given to 15- and 16-year-olds in 40 countries, girls in every country performed far better than boys in reading. Conversely, boys in all but three countries did better, but by not nearly as much, in math. In all but three countries -- Britain, Thailand and Iceland -- more boys than girls scored in the 99th percentile in math. Yet this study, published in the May 30 issue of Science, also showed a correlation between girls' performance on math tests and countries where there is more "gender equality," as measured by things such as the share of female elected officials or women's participation in the workforce. Summers was boneheaded to say what he said, in the way that he said it and considering the job that he held. But he probably had a legitimate point -- and the continuing uproar says more about the triumph of political correctness than about Summers's supposed sexism. By G. David Batty et al. Background: Risk factors for homicide are emerging; however, the predictive value of IQ, for which there is a strong prima facie case, has yet to be examined. Aims: To examine the association between IQ and risk of death by homicide. Method: A cohort of 968 846 men, aged 18-19 years, were administered an IQ test battery at military conscription and then followed for mortality experience over two decades. Results: There were 191 deaths due to homicide during follow-up. In age-adjusted analyses, a high total IQ test score was associated with a reduced rate of homicide (hazard ratio (HR) per standard deviation increase in IQ score=0.49, 95% CI 0.42-0.57). A step-wise gradient was apparent across the three IQ groups (P-value for trend <0.001). After adjustment for indicators of socio-economic position and illness at conscription, this gradient was marginally attenuated (HR=0.57, 95% CI 0.49-0.67). Conclusions: High IQ test scores in early adulthood were associated with a reduced risk of death by homicide. The British Journal of Psychiatry (2008) 193: 461-465. Hooray! L.A. Slimes in trouble: "The owner of the Los Angeles Times and other leading US newspapers, Tribune, filed for bankruptcy overnight in the latest blow to the struggling newspaper industry. The Chicago-based media giant said that it was forced to seek bankruptcy protection because of a sharp drop in revenue and a heavy debt load but has enough cash to sustain operations while it restructures. "This restructuring will bring the level of our debt in line with current economic realities and will take pressure off our operations, so we can continue to work toward our vision of creating a sustainable, cutting-edge media company," he added. Tribune is the second largest US newspaper publisher in terms of revenue and the third in terms of circulation. Besides the Los Angeles Times it owns the Chicago Tribune, Baltimore Sun, Orlando Sentinel, Hartford Courant and several other papers. It operates 23 television stations. According to media reports, Tribune is carrying some $US12 billion ($18 billion) in debt and cash flow is not enough to cover $US1 billion in interest payments due this year. A $US512 million debt payment is also due in June. Like many US newspapers, the Tribune has been grappling with declining circulation, a loss of readership to online media, and a steep drop in print advertising revenue." NYT in trouble too: "The New York Times Company plans to borrow up to $225 million against its mid-Manhattan headquarters building, to ease a potential cash flow squeeze as the company grapples with tighter credit and shrinking profits. The company has retained Cushman & Wakefield, the real estate firm, to act as its agent to secure financing, either in the form of a mortgage or a sale-leaseback arrangement, said James M. Follo, the Times Company's chief financial officer, the Times reports. The Times Company owns 58 percent of the 52-story, 1.5 million-square-foot tower on Eighth Ave., which was designed by the architect Renzo Piano and completed last year." Zogby Interactive: McCain Wins Wal-Mart Shoppers, But Obama Prevailed at Target, Macy's, Costco & JC Penney: "John McCain won the biggest battle of the 2008 electoral war for retail consumers by taking voters who most prefer to shop at Wal-Mart by 17 points. However, that was not nearly enough to overcome Barack Obama's advantage with the most loyal shoppers of other national retailers. That's the bottom line of how shoppers and the U.S. electorate made Obama our 44th President. Obama scored big increases over what John Kerry polled in 2004 at JC Penney, Sears, Kohl's and Target. We asked respondents: "If you could only shop at one of the following department stores for the rest of your life, which would you choose?" Using a different measure, weekly shopping at Wal-Mart, we found that Obama did much better than Kerry with that store's most frequent shoppers." President-elect Barack Obama pledged to work for the survival of the auto industry, but accused car company executives of a persistent "head in the sand approach" and suggested some should lose their jobs. One leading Democrat in Congress, Sen. Christopher Dodd of Connecticut, was far blunter. 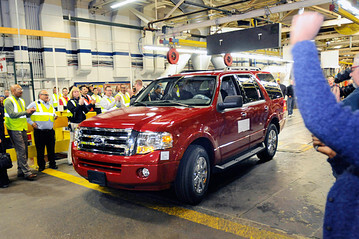 Rick Wagoner, the chief executive of General Motors Corp. (GM), "has to move on," he said Sunday. The criticism of industry leaders deepened as negotiators for the White House and Congress narrowed their differences over a plan to extend roughly $15 billion in short-term loans to any of the Detroit automakers that need it. Analysts say General Motors Corp. and Chrysler LLC, in particular, are at risk for running out of money in the next few weeks, and that Ford Motor Co. (F) may need help if the economy deteriorates further. Democratic Sen. Carl Levin of Michigan, whose state is ground zero for the battered industry, said he was confident an agreement would emerge within the next day. Democratic leaders have said they hope to pass the measure this week. While Levin declined to predict its approval, support among rank-and-file lawmakers presumably would improve dramatically if the White House and Obama were to signal their backing. In an interview broadcast Sunday on NBC's "Meet The Press," the president-elect said, "The last thing I want to see happen is for the auto industry to disappear, but I'm also concerned that we don't put $10 billion or $20 billion or $30 billion or whatever billion dollars into an industry, and then, six months to a year later, they come back hat in hand and say, 'Give me more.'" Obama, who takes office Jan. 20, has drawn some criticism from Democrats who want him to become more involved in efforts to save the industry. The president-elect said his aides are monitoring developments and considering longer-term plans. He expressed no support for calls to allow the big carmakers to enter bankruptcy and said, "We don't want government to run companies." Instead, he said, "if taxpayer money is at stake - which it appears may be the case - we want to make sure that it is conditioned on an auto industry emerging at the end of the process that actually works, that actually functions. "Taxpayers, I think are fed up. They're going through extraordinarily difficult times right now." Obama did not single out any individual executive by name for criticism and said there had been incremental progress in the past 15 years toward a more competitive line of products. "What we haven't seen is a sense of urgency and the willingness to make tough decisions. And what we still see are executive compensation packages for the auto industry that are out of line compared to their competitors, their Japanese competitors, who are doing a lot better," Obama said in the interview, taped Saturday in Chicago. Asked whether the top executives should remain in the jobs, he said, "Here's what I'll say, that it may not be the same for all the companies. But what I think we have to put an end to is the head-in-the-sand approach to the auto industry that has been prevalent for decades now." UN: Iran anti-nuclear efforts 'failed': "The head of the UN nuclear watchdog has said international efforts to halt Iranian nuclear activity have been a failure. "We haven't really moved one inch toward addressing the issues," said Mohamed ElBaradei, who heads the International Atomic Energy Agency (IAEA), in the Los Angeles Times. "I think so far the policy has been a failure." Iran has faced three sets of UN security council sanctions over its refusal to freeze uranium enrichment activities, but over the past five years Tehran has pressed on with its controversial nuclear work. The United States and other western powers suspect the Islamic republic's nuclear program is a cover for an atomic weapons-making program". Remember the Holodomor : "This year marks the 75th anniversary of one of the most horrific chapters in the history of the Soviet Union: the great famine the Ukrainians call Holodomor, `murder by starvation.' This catastrophe, which killed an estimated 6 to 10 million people in 1932-33, was largely the product of deliberate Soviet policies. Inevitably, then, its history is fodder for acrimonious disputes. Ukraine - which, with Canada and a few other countries, observed Holodomor Remembrance Day on November 23 - seeks international recognition for a Ukrainian `genocide.' Russia denounces that demand as political exploitation of a wider tragedy. Some Russian human rights activists are skeptical of both positions. Meanwhile, the famine remains little known in the West, despite efforts by the Ukrainian diaspora. Indeed, the West has its own inglorious history with regard to the famine, starting with the deliberate cover-up by Pulitzer Prize-winning New York Times correspondent Walter Duranty." Reparations, R.I.P. : "Just a few years ago, at roughly the turn of the millennium, slavery reparations seemed the coming thing. A June 2001 New York Times article reported that the movement to obtain compensation for slaves' descendants had "taken on substantial force" and was "gaining steam" both in the nation's universities, abuzz with rallies and study committees, and in the black community generally. All the major black organizations had signed on, including the NAACP, the Urban League, and the Southern Christian Leadership Conference. Randall Robinson's The Debt: What America Owes to Blacks had hit bestseller lists in 2000, announcing in impassioned tones the need to rectify "America's crime against us," a "black holocaust" that was "far and away the most heinous human rights crime visited upon any group of people in the world over the last five hundred years." True, whites outside the campus remained heavily opposed, but after the United Church of Christ became the first big multi! racial denomination to endorse the notion and the Philadelphia Inquirer called for the creation of a national reparations committee, it was only a matter of time before more whites came on board. Many state and local Democratic politicians started to talk up the idea. Then: nothing. Today, reparations seem to have completely disappeared from the national agenda. Few mention them any more. What happened?" A Hebrew lesson: "In this holiday season, Americans hear lots of talk about "Hanukkah" but most Christians-and most Jews, for that matter-don't know what that word actually means. No, Hanukkah doesn't mean "Festival of Lights," or "Festival of Tolerance" - the Hebrew word means, simply, "dedication." It refers to the re-dedication of the Temple in Jerusalem in 165 B.C., after its desecration by Hellenists who worshipped Greek Gods in the shape of men. The holiday calls for our re-dedication to resisting secularism and assimilation, and recommitting to God's commandments. The word "Hanukah" has the same root as "Hinukh" -education-emphasizing that there's no meaningful education without dedication to divine truth. At the darkest time of each year, the glowing candles of Hanukkah signal dedication to bring light to a world that too often worships men, instead of God." Jewish ancestry for Thomas Jefferson? "Was Thomas Jefferson the first Jewish president? Researchers studying Jefferson's Y chromosome have found it belongs to a lineage that is rare in Europe but common in the Middle East, raising the possibility that the third president of the United States had a Jewish ancestor many generations ago. No biological samples of Jefferson remain, but his Y chromosome, the genetic element that determines maleness, is assumed to be the same as that carried by living descendants of Field Jefferson, his paternal uncle. These relatives donated cells for an inquiry into whether Jefferson had fathered a hidden family with his slave Sally Hemings, a possibility that most historians had scoffed at. ... Michael Hammer, a geneticist at the University of Arizona, said he had compared the Jefferson Y chromosome with those in his database of Y chromosomes and found close matches with four other individuals. There was a perfect match to the Y chromosome of a Moroccan Jew, and matches that differed by two mutations from another Moroccan Jew, a Kurdish Jew and an Egyptian. Dr. Hammer said he would "hazard a guess at Sephardic Jewish ancestry" for Jefferson, although any such interpretation was highly tentative." A previous citizenship fraud: "Chester Arthur perpetrated a fraud as to his eligibility to be Vice President by spreading various lies about his parents' heritage. President Arthur's father, William Arthur, became a United States citizen in August 1843. But Chester Arthur was born in 1829. Therefore, he was a British Citizen by descent, and a dual citizen at birth, if not his whole life. He wasn't a "natural born citizen" and he knew it." Questions raised over Barack Obama's citizenship are reaching into the National Press Club now, with an event scheduled Monday at which an activist group will call for the release of documentation proving his eligibility to occupy the Oval Office. Already, at least one legal advocacy group is promising to raise legal challenges to whatever Obama would do as president, until and unless his eligibility is established. Now the group that has aired and published a number of ads challenging Obama based on charges that he was born in Kenya, not Hawaii, and doesn't meet the U.S. Constitution's requirement that all presidents be "natural-born" citizens has scheduled a news conference in Washington. Among those scheduled to be present are attorneys handling a Pennsylvania case brought by Philip Berg, a New Jersey case brought by Leo Donofrio and a California case brought by Orly Taitz. The U.S. Supreme Court justices were scheduled to have a conference today on whether to accept arguments on the issue, but no immediate announcement was made. WeThePeopleFoundation.org, which is scheduling the event, will talk about Obama's response to the publication of an open letter last week in the Chicago Tribune. More than a dozen legal challenges have been initiated over Obama's citizenship, all citing Obama's clouded history and the U.S. Constitution's requirement that a president be a natural born citizen. There have been allegations Obama was born in Kenya, not Hawaii as his campaign has reported, that he could be considered a British subject because of his father's residency in what then was a British protectorate that later became Kenya, and that the "Certification of Live Birth" posted on his website simply shows his mother registered his birth in Hawaii after he was born, but does not document a location of birth. WND senior reporter Jerome Corsi traveled to Kenya and Hawaii prior to the election to investigate issues surrounding Obama's birth. But his research and discoveries only raised more questions. The biggest question remains why Obama, if a Hawaii birth certificate exists, simply hasn't ordered it made available to settle the rumors. The dispute has been covered mostly by online news sources, but in recent days, Washington and Philadelphia newspapers have begun following, CNN and Fox have commented and even the American Bar Association Journal has noted the dispute. The governor's office in Hawaii said there is a valid certificate but rejected requests for access and left ambiguous its origin. Obama's half-sister, Maya Soetoro, has named two different Hawaii hospitals where Obama could have been born, while a video posted on YouTube features Obama's Kenyan grandmother Sarah claiming to have witnessed Obama's birth in Kenya. Schulz' open letter asked that Obama have delivered to the National Press Club a certified copy of the original birth certificate, including any under the names Barack Husssein Obama, Barry Soetoro, Barry Obama, Barack Dunham and Barry Dunham, a certificate of his citizenship and admission forms for his attendance at Occidental College, Columbia and Harvard. The dispute is facing an immediate deadline, because members of the U.S. Electoral College are scheduled to vote Dec. 15 formally to make Obama the next president. "Should the state members of the Electoral College cast their votes for Mr. Obama in the face of such overwhelming evidence, and without verification of Mr. Obama's eligibility, they would be committing treason to the Constitution," Schultz said. And in an analysis in the Philadelphia Bulletin, constitutional lawyer Edwin Vieira, suggested there would be major problems should Obama not be eligible, and assume the office anyway. "Let's assume he wasn't born in the U.S.," Vieira told the Bulletin. "What's the consequence? He will not be eligible. That means he cannot be elected validly. The people and the Electoral College cannot overcome this and the House of Representatives can't make him president. So what's the next step? He takes the oath of office, and assuming he's aware he's not a citizen, then it's a perjured oath." The result would be any appointments made an ineligible president, and all the appointees' decisions, would be invalid, he said. Vieira suggested Obama supporters should be the ones raising the questions, because of the discredit that would follow a revelation of ineligibility. "Let's say we go a year into this process, and it all turns out to be a flim-flam," Vieira told the newspaper. "What's the nation's reaction to that? What's going to be the reaction in the next U.S. election? God knows. It has almost revolutionary consequences, if you think about it." He also suggested Obama's silence on the issue, itself, is a concern. Vieira told the newspaper the question is significant because it involves the man who could have his finger next to a nuclear button. He also said the question would remain whether any laws he signs would be valid. Even after Obama takes the oath of office, the questions will remain, he suggested. Wes Pruden, editor emeritus of the Washington Times, said Obama's refusal to authorize release of his birth certificate has fueled the dispute. "This has led to furious speculation on the Internet that Mr. Obama's parents returned to Hawaii with him shortly after his birth and simply registered his Kenyan birth certificate, certified by the doctor who delivered him and by the hospital where he was born, with the Hawaii Department of Health. Why, these skeptics ask, won't the president-elect authorize release of the original Hawaii certificate and squelch speculation once and for all?" he said. "It's a good question, though lack of his asking doesn't prove anything." The barbarism in Mumbai and the economic crisis at home have largely overshadowed an otherwise singular event: the ratification of military and strategic cooperation agreements between Iraq and the United States. They must not pass unnoted. They were certainly noted by Iran, which fought fiercely to undermine the agreements. Tehran understood how a formal U.S.-Iraqi alliance endorsed by a broad Iraqi consensus expressed in a freely elected parliament changes the strategic balance in the region. For the United States, this represents the single most important geopolitical advance in the region since Henry Kissinger turned Egypt from a Soviet client into an American ally. If we don't blow it with too hasty a withdrawal from Iraq, we will have turned a chronically destabilizing enemy state at the epicenter of the Arab Middle East into an ally. Also largely overlooked at home was the sheer wonder of the procedure that produced Iraq's consent: classic legislative maneuvering with no more than a tussle or two - tame by international standards (see YouTube: "Best Taiwanese Parliament Fights of All Time!") - over the most fundamental issues of national identity and direction. The only significant opposition bloc was the Sadrists, a mere 30 seats out of 275. The ostensibly pro-Iranian religious Shiite parties resisted Tehran's pressure and championed the agreement. As did the Kurds. The Sunnis put up the greatest fight. But their concern was that America would be withdrawing too soon, leaving them subject to overbearing and perhaps even vengeful Shiite dominance. The Sunnis, who only a few years ago had boycotted provincial elections, bargained with Prime Minister Nouri al-Maliki, trying to exploit his personal stake in agreements he himself had negotiated. They did not achieve their maximum objectives. But they did get formal legislative commitments for future consideration of their grievances, from amnesty to further relaxation of the de-Baathification laws. That any of this democratic give-and-take should be happening in a peaceful parliament just two years after Iraq's descent into sectarian hell is in itself astonishing. Nor is the setting of a withdrawal date terribly troubling. The deadline is almost entirely symbolic. U.S. troops must be out by Dec. 31, 2011 - the weekend before the Iowa caucuses, which, because G-d is merciful, will arrive again only in the very fullness of time. Moreover, that date is not just distant but flexible. By treaty, it can be amended. If conditions on the ground warrant, it will be. True, the war is not over. As Gen. David Petraeus repeatedly insists, our (belated) successes in Iraq are still fragile. There has already been an uptick in terror bombings, which will undoubtedly continue as what's left of al-Qaeda, the Sadrist militias and the Iranian-controlled "special groups" try to disrupt January's provincial elections. The more long-term danger is that Iraq's reborn central government becomes too strong and, by military or parliamentary coup, the current democratic arrangements are dismantled by a renewed dictatorship that abrogates the alliance with the United States. Such disasters are possible. But if our drawdown is conducted with the same acumen as was the surge, not probable. A self-sustaining, democratic and pro-American Iraq is within our reach. It would have two hugely important effects in the region. First, it would constitute a major defeat for Tehran, the putative winner of the Iraq war, according to the smart set. Iran's client, Moqtada al-Sadr, still hiding in Iran, was visibly marginalized in parliament - after being militarily humiliated in Basra and Baghdad by the new Iraqi security forces. Moreover, the major religious Shiite parties were the ones that negotiated, promoted and assured passage of the strategic alliance with the United States, against the most determined Iranian opposition. Second is the regional effect of the new political entity on display in Baghdad - a flawed yet functioning democratic polity with unprecedented free speech, free elections and freely competing parliamentary factions. For this to happen in the most important Arab country besides Egypt can, over time (over generational time, the time scale of the war on terror), alter the evolution of Arab society. It constitutes our best hope for the kind of fundamental political-cultural change in the Arab sphere that alone will bring about the defeat of Islamic extremism. After all, newly sovereign Iraq is today more engaged in the fight against Arab radicalism than any country on earth, save the United States - with which, mirabile dictum, it has now thrown in its lot. With help from Congress, homeowners could rescue themselves : "The U.S. Treasury and Federal Reserve may need more than $700 billion to shore up bank balance sheets and restart the economy. So far, the ideas from Congress are doing nothing to improve the current dismal economic outlook. Instead of pouring capital into banks and trying to rescue homeowners who cannot meet their mortgage obligations, Congress can make a simple change to the tax code and let homeowners come to the rescue. . Homeowners held $11.2 trillion in mortgage debt at the end of June. They also held about $17 trillion in retirement assets . at the end of March. Unfortunately, these retirement assets are smaller now, but more unfortunate is that these assets cannot be used without penalty before reaching age 59-1/2, excepting hardship cases, first-time home buyers, and specific educational purposes. Congress should change these rules." India - the other side of glory : "It has been said - and Chile, South Korea and Taiwan seemed to play into that narrative - that only autocracies could enable the painful process of opening up an economy to competition because democracies, with their conflicting demands and political divisions, tend to reverse free-market reform before it reaches a critical mass of people. India, with a 60-year-old democracy, throws cold water on that premise. But for many Indians, development is still an elusive goal. The country is socially stratified and millions of citizens, led by wily politicians, define their identity in religious or ethnic - i.e., collectivist - terms. This holds India back from catching up with modern liberal democracies in which rights are by and large based on the individual." I am one of the many who believe that we all have inborn moral responses. So when people say that something is "just wrong" they are not really being incoherent but are being guided by strongly felt moral instincts in themselves. I set out my thoughts on the matter at more length here. "A new study has found that people are more likely to be lenient in making decisions if they have just washed their hands. British scientists who carried out the research said the findings suggest that jurors in criminal trials who have cleansed their hands may make their verdict less severe. And voters may be more likely to excuse a politician's misdemeanours when going to the ballot box if they have just had a shower. In the study, 22 people who had washed their hands, and 22 who had not, were made to watch a disgusting three-minute clip of heroin addicts from the hit film Trainspotting. All 44 were then asked to rate how morally wrong they deemed the series of acts shown to them on a scale of one to nine, with one being acceptable and seven being very wrong. The actions included stealing money from a wallet, lying on a job application, cooking and eating the family dog, killing a dying plane crash survivor to avoid starvation, and abusing a kitten. All said they thought the actions were 'wrong'. However, the participants who had washed their hands were less likely to judge the actions as harshly as the group who had not. In another experiment, a group was asked to read sentences with words such as 'purity' and 'cleanliness' before being posed the same moral dilemmas. Another group was given sentences with neutral words. Again, the 'clean' group judged the unethical behaviour less harshly. Lead researcher Dr Simone Schnall, a psychologist at the University of Plymouth, said: "We like to think we arrive at decisions because we deliberate, but incidental things can influence us. "This could have implications when voting and when juries make up their minds." Lancaster University psychologist Professor Carey Cooper described the findings as "terrifying". He said: "It suggests that washing can make us more prepared to accept wrongdoing. "It is very scary when you think of the implications, especially in the judicial world." The original report of the research is here. So judgments of right and wrong are simply not rational. They are instinctive. I think conservatives will be a lot more comfortable with that than Leftists are. Leftist don't think ANYTHING (except homosexuality) is instinctive. One should note however that the setting of the research was deliberately designed to draw out instinctive responses. People on a jury (for instance) may be less influenced by irrelevancies. Nonetheless it has long been known in psychological research that incidental factors can influence research results. This is merely the latest instance of it. The original research article gives some interesting and plausible theoretical background to what they found. If I were being devil's advocate, I would say that the results show that middle-class young women in Britain have been taught to associate cleanliness with virtue and to associate virtue with mercy so the old "more research is needed" applies here too. Would you get the same results with Lebanese? Maybe not. If money talks, we'll likely soon hear the real reason why Barack Obama beat John McCain. Both men and the national parties will report to the Federal Election Commission today how much money they raised in October and November. And what the numbers will probably show is that Mr. Obama outspent Mr. McCain by the biggest margin in history, perhaps a quarter of a billion dollars. Between then and Oct. 15, the Obama/DNC juggernaut raised $658.7 million. I estimate today's reports will show Mr. Obama, the DNC and two other Obama fund-raising vehicles raised an additional $120 million to $140 million in October and November, giving them a total of between $827 million and $847 million in funds for the general election. Mr. McCain and the RNC spent $550 million in the general election, including the $84 million in public financing Mr. McCain accepted in exchange for his campaign not raising money after the GOP convention. How did Mr. Obama use his massive spending advantage? He buried Mr. McCain on TV. Nielsen, the audience measurement firm, reports that between June and Election Day, Mr. Obama had a 3-to-2 advantage over Mr. McCain on network TV buys. And Mr. Obama's edge was likely larger on local cable TV, which Nielsen doesn't monitor. A state-by-state analysis confirms the Obama advantage. Mr. Obama outspent Mr. McCain in Indiana nearly 7 to 1, in Virginia by more than 4 to 1, in Ohio by almost 2 to 1 and in North Carolina by nearly 3 to 2. Mr. Obama carried all four states. Mr. Obama also used his money to outmuscle Mr. McCain on the ground, with more staff, headquarters, mail and a larger get-out-the-vote effort. In mid-September the Obama campaign said its budget for Florida was $39 million. The actual number was probably larger. But in any case, Mr. McCain spent a mere $13.1 million in the state. Mr. Obama won Florida by 2.81 percentage points. Mr. McCain was outspent by wide margins in every battleground state. But it would have been worse for him if RNC Chairman Mike Duncan and Finance Chairman Elliott Broidy hadn't stockpiled funds in 2007 and early 2008. The RNC provided nearly half the funds for the GOP's combined general-election campaign, while the DNC provided less than a tenth of the funds that benefited Mr. Obama. To diminish criticism, Mr. Obama's campaign spun the storyline that he was being bankrolled by small donors. Michael Malbin, executive director of the Campaign Finance Institute, calls that a "myth." CFI found that Mr. Obama raised money the old fashioned way -- 74% of his funds came from large donors (those who donated more than $200) and nearly half from people who gave $1,000 or more. But that's not the entire story. It's been reported that the Obama campaign accepted donations from untraceable, pre-paid debit cards used by Daffy Duck, Bart Simpson, Family Guy, King Kong and other questionable characters. If the FEC follows up with a report on this, it should make for interesting reading. Mr. Obama's victory marks the death of the campaign finance system. When it was created after Watergate in 1974, the campaign finance system had two goals: reduce the influence of money in politics and level the playing field for candidates. This year it failed at both. OpenSecrets.org tells us a record $2.4 billion was spent on this presidential election. And with Mr. Obama's wide financial advantage, it's clear that money is playing a bigger role than ever and candidates are not competing on equal footing. Ironically, the victim of this broken system is one of its principal architects -- Mr. McCain. He helped craft the Bipartisan Campaign Finance Reform along with Sen. Russ Feingold in 2002. No presidential candidate will ever take public financing in the general election again and risk being outspent as badly as Mr. McCain was this year. And even liberals, who have long denied that money is political speech that should be protected by First Amendment, may now be forced to admit that their donations to Mr. Obama were a form of political expression. It is time to trust the American people and remove limits on how much an individual can donate to a campaign. By doing that, we can design a system that will be much more open by requiring candidates to frequently report donations in an online database. Technology makes this possible. Such a system would be easier for journalists to use and would therefore make it more likely that fund raising would be included in news coverage. That would give voters the tools they need to determine if a candidate is getting too much from unattractive people. Rather than showing the success of a new style of post-partisan politics, Mr. Obama's victory may show the enduring truth of the old Chicago Golden Rule: He who has the gold rules. Palin Derangement Syndrome: "Did you know that Sarah Palin-haters are still trying to prove she didn't give birth to her youngest son, Trig? These tinfoil hat-wearers are as obnoxious and unhinged as the 9/11 Truth cultists who insist that America engineered the jihadi attacks on itself. The presidential campaign may be over, but there's no expiration date on Palin Derangement Syndrome." He should have fried long ago: "Ex-US football star OJ Simpson has been jailed for up to 33 years for the kidnap and armed robbery of two sports memorabilia dealers in Las Vegas. Describing Simpson as arrogant and ignorant, Judge Jackie Glass said the evidence against him was overwhelming. He and an accomplice, Clarence Stewart, were convicted on 12 counts in October. Simpson, who could be eligible for parole in nine years, made an emotional plea at the Las Vegas court sentencing, saying he was "sorry" and "confused". The Cleanest State Meets the Pushiest Person : "Until now, Minnesota was always famous for its clean elections. Indeed, Democratic consultant Bob Beckel recently attested to the honesty of Minnesota's elections, joking: "Believe me. I've tried. I've tried every way around the system out there, and it doesn't work." But that was before Minnesota encountered the pushiest, most aggressive, most unscrupulous person who has ever sought public office, Al Franken. On Election Day, Franken lost the U.S. Senate race in Minnesota to the Republican incumbent Sen. Norm Coleman by 725 votes. But over the next week, Democratic counties keep discovering new votes for Franken and subtracting votes from Coleman, claiming to be correcting "typos." In all, Franken picked up 459 votes and Coleman lost 60 votes from these alleged "corrections."